Figure 13-4 Solar-powered phone charger schematic: car charger. Figure 13-5 Solar-powered phone charger schematic: USB type. 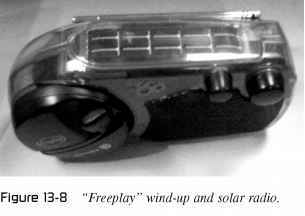 A solar radio is another great idea! Never mind "Desert Island Discs," with a solar radio, you can ensure that if you are ever marooned, you are able to listen to your favorite radio stations! In this circuit we are going to build a simple AM radio that is powered by the sun. 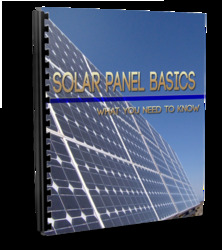 There are some commercially available radios powered by solar energy; however, it is relatively easy to build your own. We are basing this circuit around the MK484 integrated circuit, which takes all the hassle out of building a simple radio. The integrated circuit looks like a transistor with three pins, and reduces the amount of external components needed considerably. The schematic for the circuit is shown in Figure 13-6. The radio has two controls. 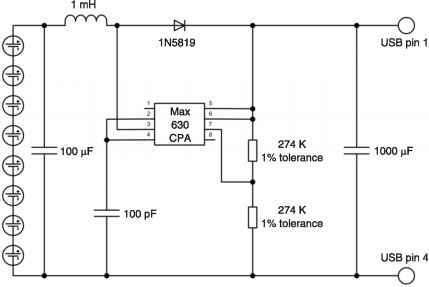 The variable capacitor changes the frequency that you are tuned to, and the potentiometer acts as a volume control for the simple transistor amplifier. Figure 13-6 Solar AM radio schematic. 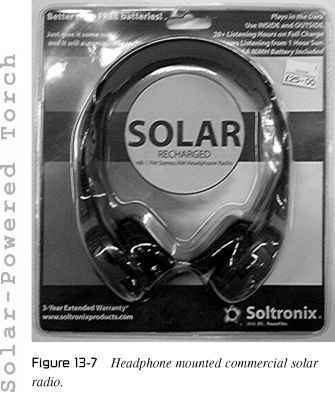 could easily accomplish with the solar radio circuit above, is to mount the circuit in a set of headphones, like the solar radio shown in Figure 13-7.
two renewable energy sources—solar power, and for less sunny days "human wind-up power" in order to make sure that even when the sun doesn't shine, you aren't without your tunes! 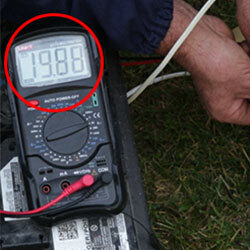 How to create a solar powered usb charger?